I’ve been short changed when ordering a round of drinks at the bar on many an occasion. Okay, I admit that sometimes I’ve been out with friends and we’ve all been a bit merry and I haven’t checked my change until it was too late. We all make mistakes, and so do bar staff. The onus is on the customer to check change given, because as they say 'mistakes cannot be rectified later'. However, I do get the feeling sometimes, that some bar staff in some pubs and clubs are a bit unscrupulous and seek to take advantage of customers once they have had a few too many drinks. They’re okay at the beginning of the evening and you’ll always get the correct change. But a few rounds later on, they are in the perfect position to know who is getting a bit drunk and could be fobbed off with change from a tenner instead of a twenty! Maybe they also watch customers to see who checks their change and who doesn't. Also, I’ve noticed that in general I am more likely to get short changed at some trashy club type place than you’re traditional drinking pub. The bar staff in these places are usually quite busy on a Friday and Saturday night, but it’s not like they have to do arithmetic in their head to work out how much change to give you back. I’m not having a go at all bar staff in general though. The very large majority of them are professional, hard working and pleasant to customers. I have no problem with them. There is definitely however, a very small minority that would exploit customers to line their own pocket and these are the ones I have a gripe with. Totally agree, they can be crafty on the drinks too. Bar staff aren't always to blame. Customers where I work are always trying to pull a fast one and accuse us of giving them change for a five or a ten when they gave us a ten or a twenty, and try and kick up a fuss hoping we'll give in and just give them the money. Either that or they're too stupid to realise what note they actually gave us, or have lost it or spent it and not realised that either. This happened to me only two nights ago, and the person who accused me of robbing was not only unspeakably rude when I was perfectly polite and helpful, but also asked for my name and threatened to get me fired. I showed her my tips, which amounted to £1.80 and she still did not believe me. Turns out my till was spot on. What a surprise. It's one of the perks of working as a bartender. Another one is to pick up the coins and banknotes lying on the dance floor after the bar is closed. These perks compliment the wages bar staff receive - which is generally not a lot. This is why a fully comprehensive price list for all drinks, easily readable, must be made available at ALL bars where drinks are served self service. By law it must be there. Why do we let them get away with it? Breaking the law that is. I was bar staff for 10 years. Though I never encountered this problem in any of the pubs I worked in, I did see it regularly in clubs - and, as you say, it was usually with people who had had quite a few drinks. It is called theft. You can insist they zero the till and count it up. Just keep an eye on it in case someone tries to get the money out whilst you are still looking. Or, even better, what I always used to do was, as I handed over the note, said very loudly THAT'S A TWENTY! Believe me, you always get change of a twenty!! I have had the same problem with club staff who are too busy to do their job correctly. When I was in Liquid nightclub in Gloucester I was at the bar and didn't check my change until the next round was due. thats when I noticed that I was short changed. I think I have had this happen two or three tI'mes where bar staff have given me the wrong change, normally change from a ten and not a twenty, or they have given me a fiver and not a tenner. I think that they are funny when they have been caught out. You see I have been ill for a few years and I can often look drunk when im not (blood shot and glazed eyed) and normally its late when I have finished work and head out, most of the short changing happens within the first two rounds which is often around 11-12 O'clock and as I spend cash and have checked what money I have before going out, then its not hard to do the math. I have also heard of a few people being short changed OR that the staff charge different prices on the bars over charging people. It is worth knowing that a legal requirement is that a price list should be shown and its often worth checking. I've notice that too, I've had quite a few foreign coins in my change at a pub. I've also been short changed on a few occasions as well, mostly at the en of a night though when the place is busy. Whether or not it is down to the staff being busy or thinking they can get one over on someone who's had a few too many beers I can't say. I have noticed, not only are you short changed, and given foreign coins, but you are sold short quantities. Local council trading standards are not doing their job. Traders are getting away with breaking the law all the time. These guys are crooks. Put them away. One day I went to an ice cream stop and received a Canadian penny as part of my change. The following day I went to another store, bought what I wanted, and received a Canadian quarter and penny. Not that it matters so much, but give me my right change. Went to a bar Restaurant on Saturday night, we had a meal and 1 round of drinks the bill came to £96, very expensive as we only had main meals and 1 round of drinks, after looking at the receipt they had charged me 20% service charge, I complained and told this was company polices to charge this,!!!! Avoid this please like the plague unless you are willing to spend at least £30 for a round of drinks 2 of which were alcohol free. 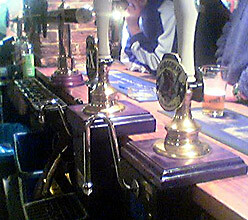 Seems to me that some unscrupulous bar staff will take advantage of unsuspecting customers.Had it happen to me more than once in a large chain pub in Southend.Always ask for a reciept,especially when buying a round of drinks.If short changed then kick up a fuss and tell them to get the manager.Take their names and tell them you will report them to the brewery head office.That will soon make them squeal.Don't be ripped off. I was short changed last night at a night club, and I told her that I gave her a twenty not a ten, she then accused me of lying, I got them to send a manager so I can complain, and he said he couldnt check the till untill the morning, I left my name and number, and guess what, they havent got back to me.